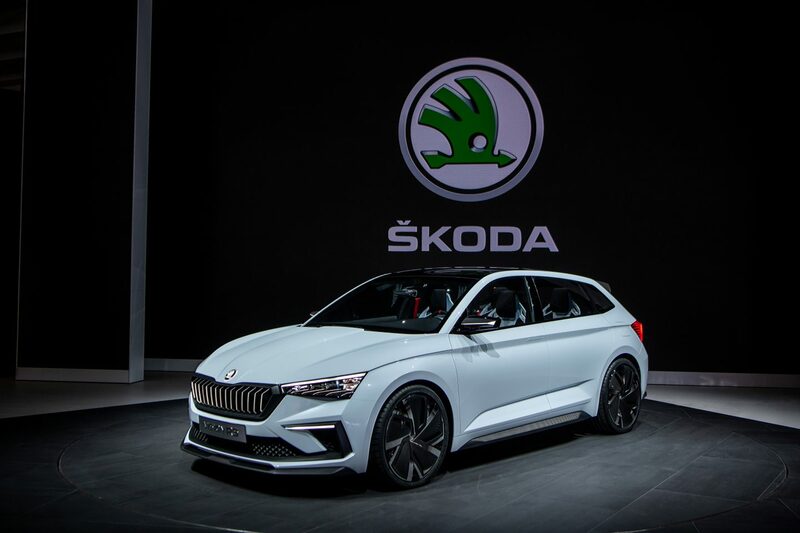 The ŠKODA VISION RS is a new dynamic concept showcasing the future of RS sports genes and hinting at the look of the upcoming new compact hatchback. 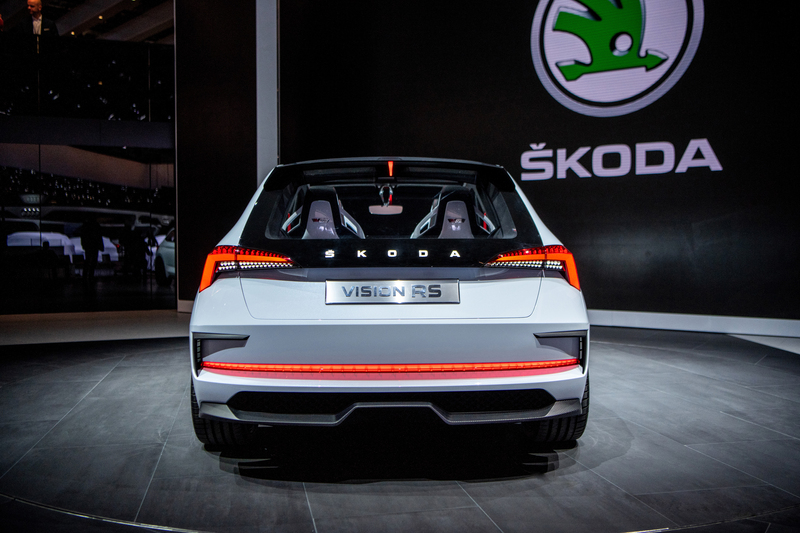 Check it out in our photos and video from the Paris Motor Show. Racing and motorsport served as inspiration for the team of designers. According to Dalibor Pantůček, the exterior designer, the goal was to devise a shape that would be brimming with emotion and momentum and bursting with energy. The low-hanging fascia – with its sharply cut forms, contrasting black grille and air intake integrated into the bumper with glowering LED headlights – looks very impressive. “The VISION RS exudes poise. 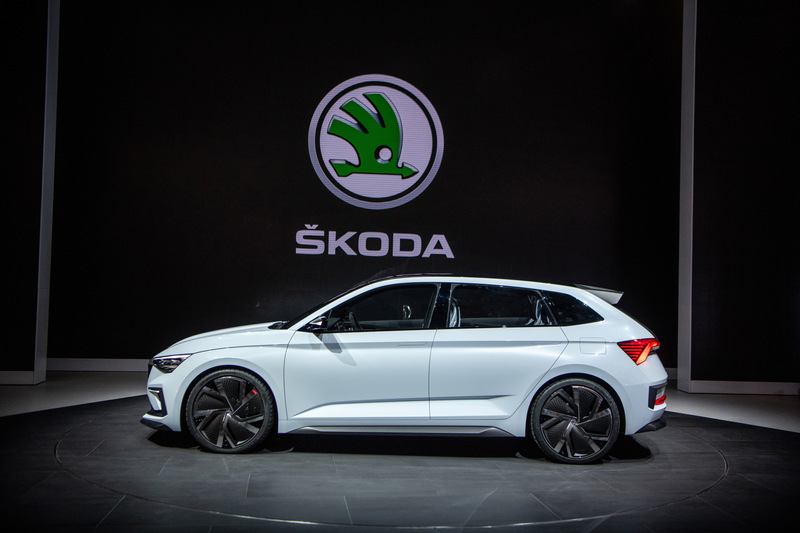 Its muscular athleticism contrasts with the crisp-cut lines and edges typical for a ŠKODA, alluding to the inspiration garnered from Bohemian crystal and the traditional art of master glassmaking. Thanks to this styling, a wonderful dance of light and shadow plays out on the car. The car comes across as a dynamic sculpture,” says exterior designer Dalibor Pantůček. 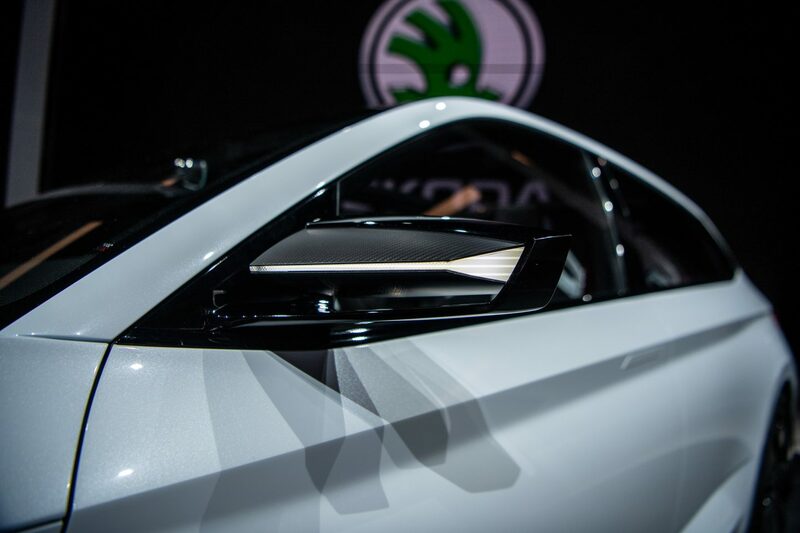 The rear section is dominated by a diffuser built into the bumper, which also incorporates the wide strip of light reflector so typical of ŠKODA RS models. 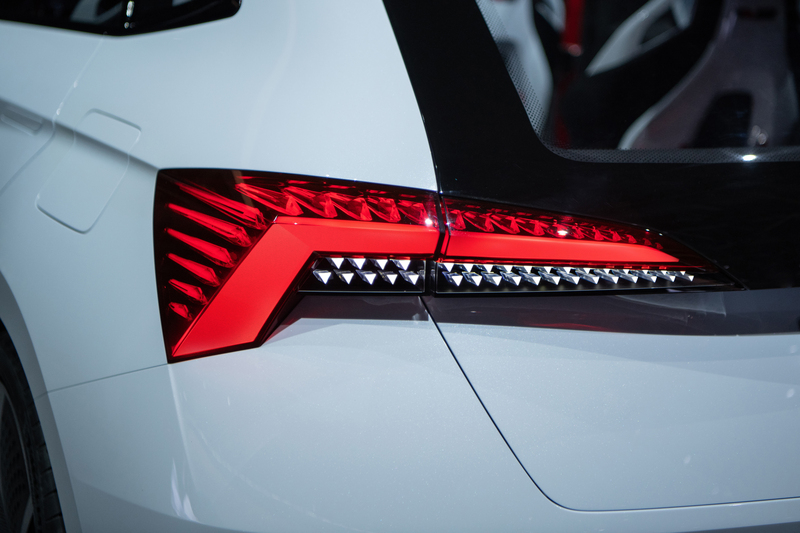 The roofline is visually extended by the aerodynamically optimised roof spoiler with integrated third brake light. During development, the team of designers paid particular attention to the car’s aerodynamics and placed an emphasis on weight reduction, which helps to improve performance as well as to lower the fuel consumption and emissions. 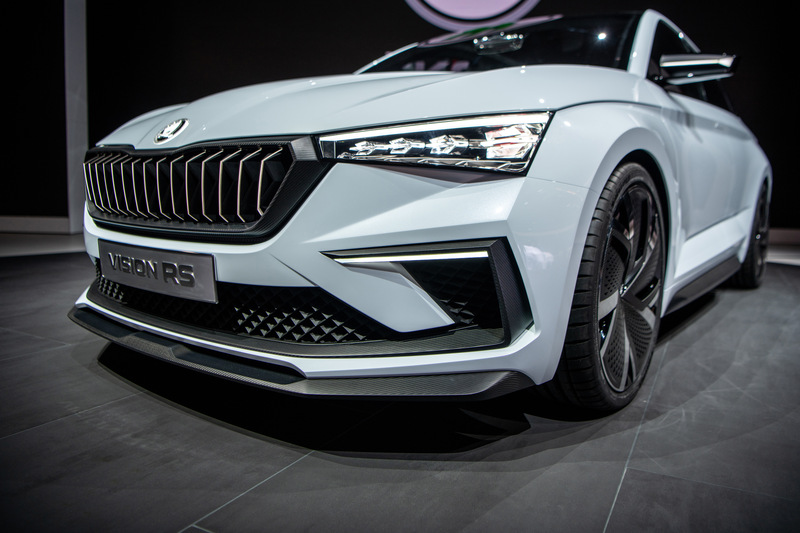 Consequently, the VISION RS features a raft of parts made from carbon fibres, a material often used in motorsport because it combines lightness with strength. 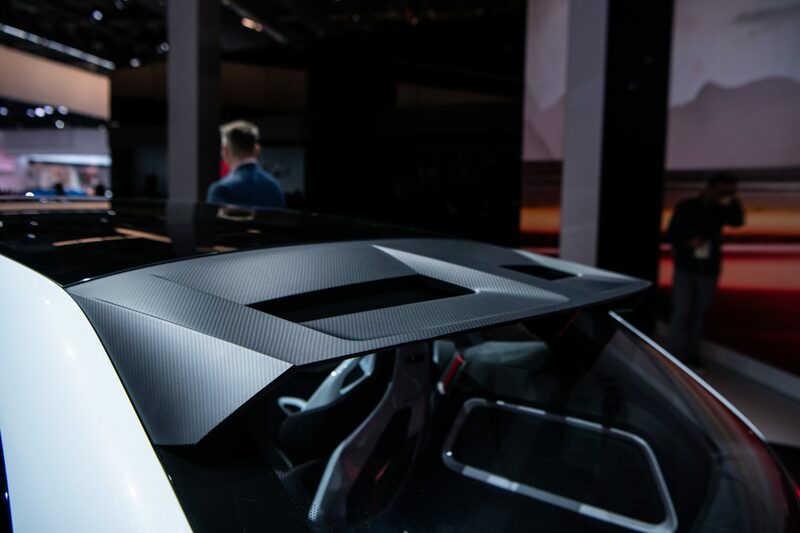 Carbon has been used for the entire aerodynamic kit (the front and rear spoiler, diffuser and side skirts), as well as the wing mirror covers, which, with their motorsport-inspired design, help to reduce aerodynamic resistance even more. The front bumper’s air intakes and the grille are also woven from carbon fibres. 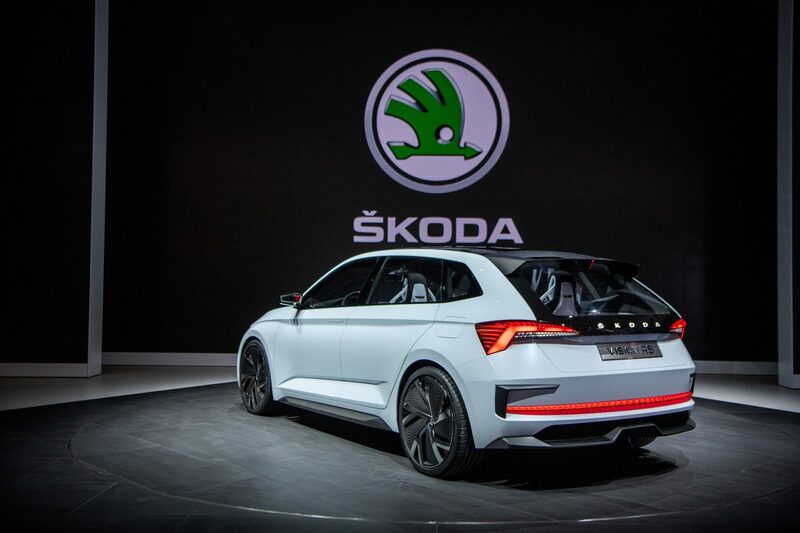 Above the grille sits the lead-glass ŠKODA logo, backlit for extra effect (as is the radiator grille). 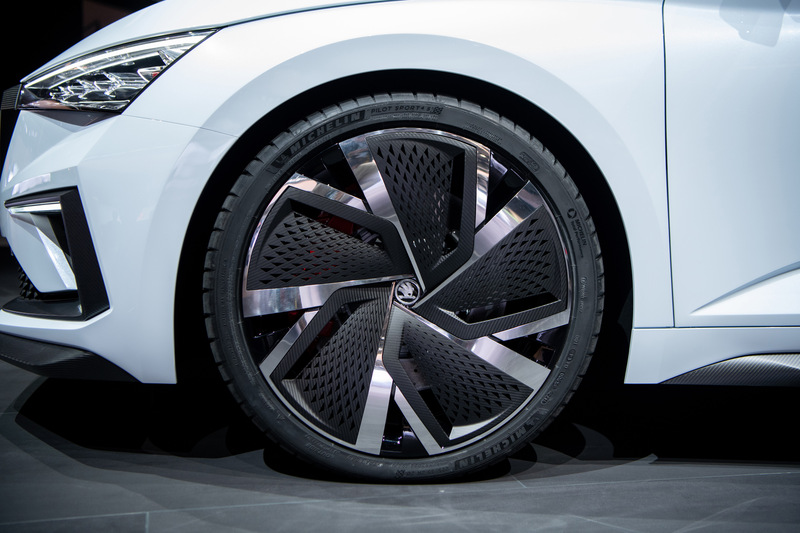 The 20" alloy wheels, modified to reduce aerodynamic drag, feature a centre glass ŠKODA logo with carbon-fibre details. Also note the recessed handles, which do not disrupt the smooth side surfaces and do not aggravate the airflow around the car. 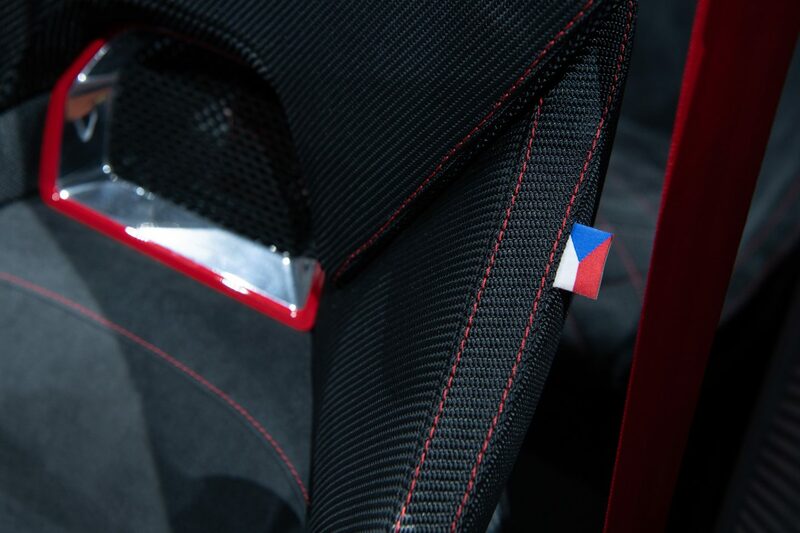 In the carbon sills, there are small Czech flags to commemorate this year’s centenary of the founding of Czechoslovakia. A connoisseur’s fine eye will be drawn to the fifth-door glass, which follows on fluidly from the panoramic roof and, at the bottom, elegantly links up to the rear LED lights. This impressive design tactic first appeared in the first-generation RAPID SPACEBACK, but here it has been perfected. By the way, have you noticed that the rear section has no visible tailpipes? This accentuates that the VISION RS drive is backed by an environmental plug-in hybrid system. The central plank of this set-up is a 1.5 TSI 150 PS petrol engine, accompanied by a 102 PS electric motor. Both the TSI engine and electric motor propel together the front wheels via a DSG six-speed dual-clutch transmission delivering combined power of 245 PS. As a result, it can handle acceleration of 0-100 km/h in just 7.1 seconds, and can reach speeds of up to 210 km/h. All this with combined emissions of a paltry 33 g CO2/km. 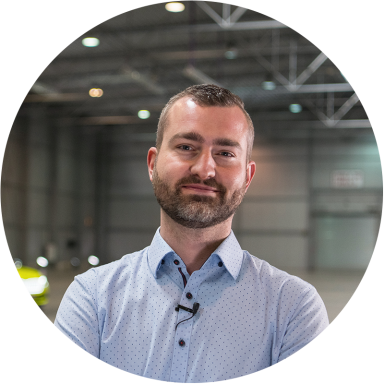 “The goal of the VISION RS has been to epitomise the modern and environmental concept now bound up with the sportiness of high performance ŠKODA RS models, where we place great emphasis on ecology, aerodynamics and efficiency,” explains Dalibor Pantůček. The interior design has advanced elements of the previous VISION X concept, introduced in Geneva in spring 2018. 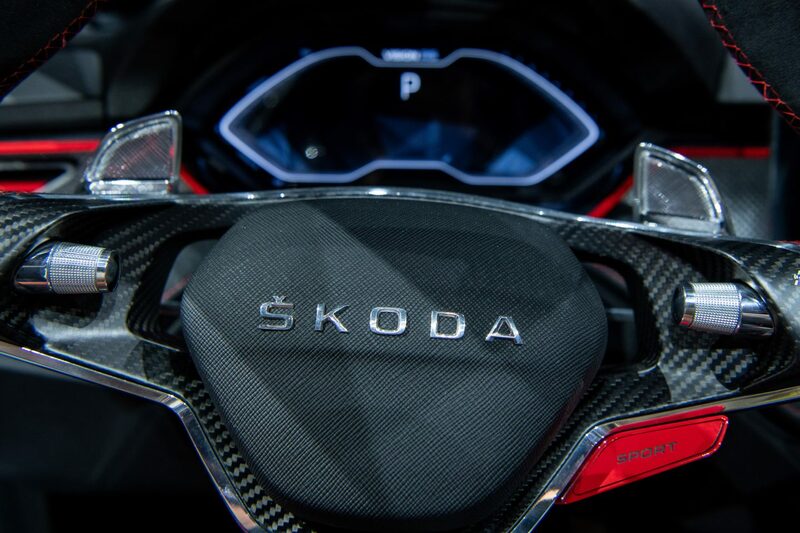 The elongated dashboard with carbon-fibre features has assumed the symmetrical contours of the grille. The dashboard décor consists of hand-cut crystal supplied by Lasvit. 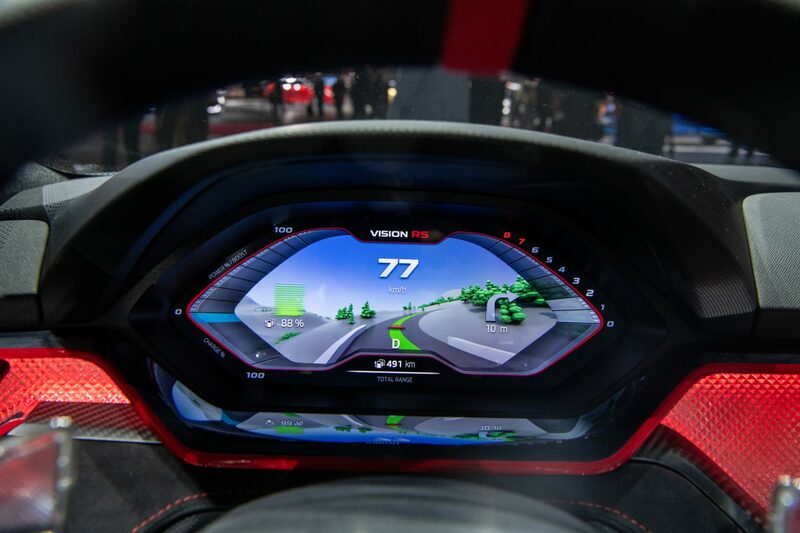 The dashboard incorporates special RS-design animations and is illuminated with lighting effects in sync with the infotainment system touchscreen. 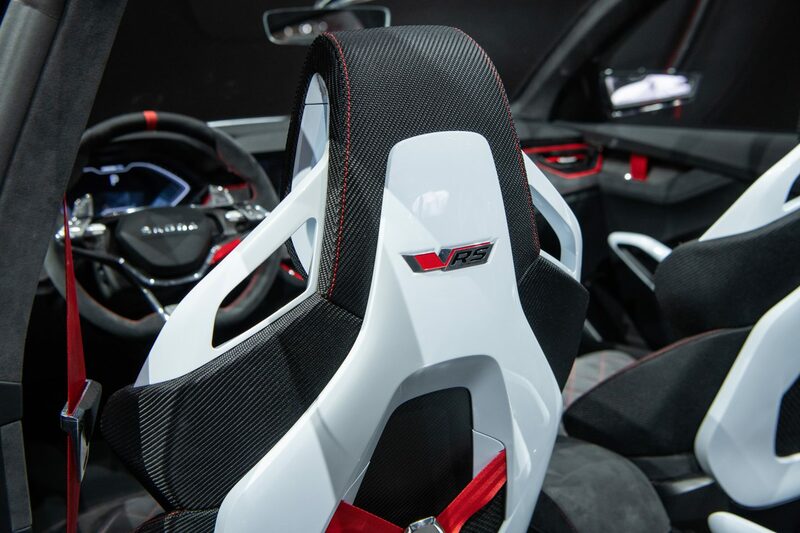 The carbon-fibre was also used in the interior of the vehicle – the centre console features a rally-inspired space frame with an integrated DSG shift-by-wire system. 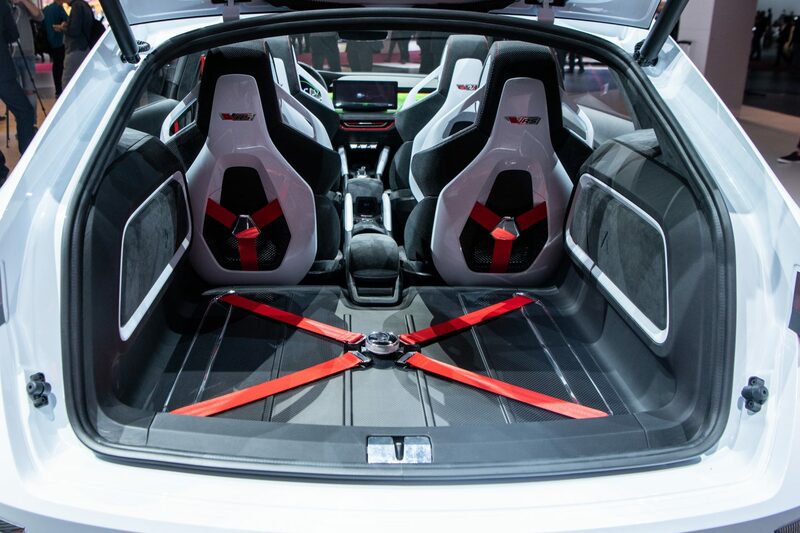 Graphite composite also dominates the decorative trim, the door panels and the seat buckets, which take their cue from the world of motorsport. 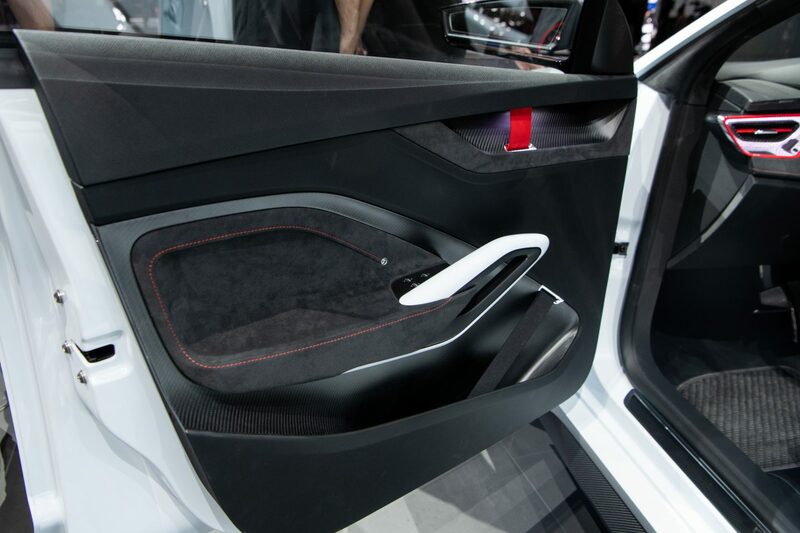 The loops replacing handles in door panels also smack of a car built for racing. Rubber-band-secured storage compartments are a Simply Clever feature. The sporty look aside, the VISION RS study goes all out to be environmentally friendly. 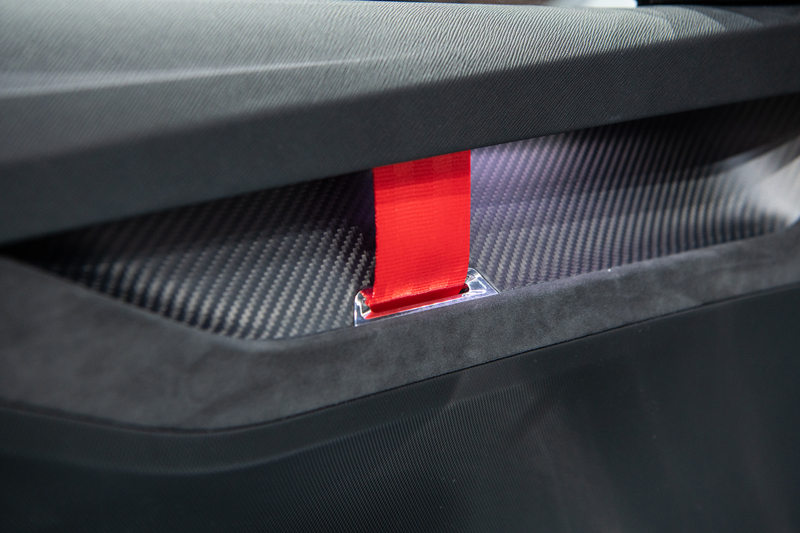 The carbon fibre is made from 100% recycled polyester and the seat covers are made from vegan Alcantara. “The VISION RS concept is a celebration of our sporting traditions, our rich history and the achievements we have chalked up in motorsport. 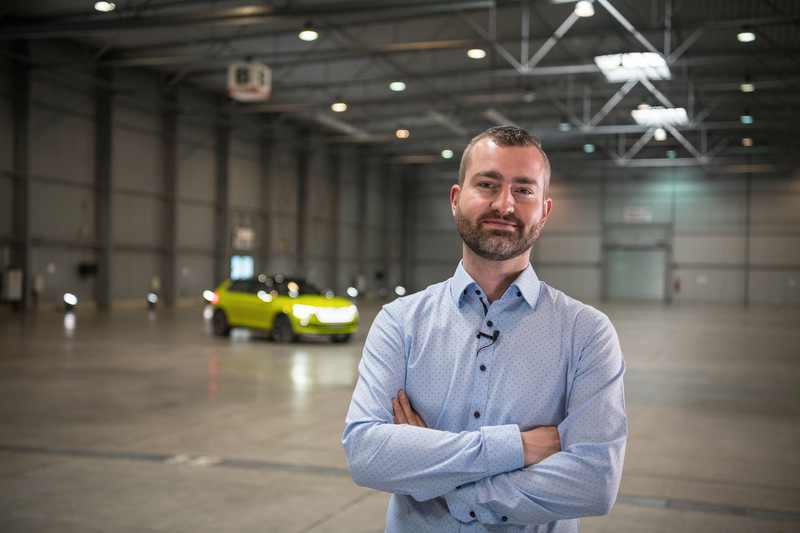 It is a glimpse of what is in store for the successfully expanding family of ŠKODA RS models as a whole and for their design language,” says Dalibor Pantůček as he rounds off what makes the carmaker’s latest concept, the plug-in hybrid ŠKODA VISION RS, stand out.